Life's experiences from a mountain girl's perspective. Pledging their love to the ground! Drifting along with the tumbling tumbleweeds . . .
I’ve linked an MP3 which is hosted on SoundCloud and as part of this blog. It’s short and sweet, but I would love to hear any comments you might have in reference to including audio. I had taken so many photos on this drive, that I decided to turn them into a slide show and posted them as a link to this blog. Let me know your thoughts on slide shows, too. 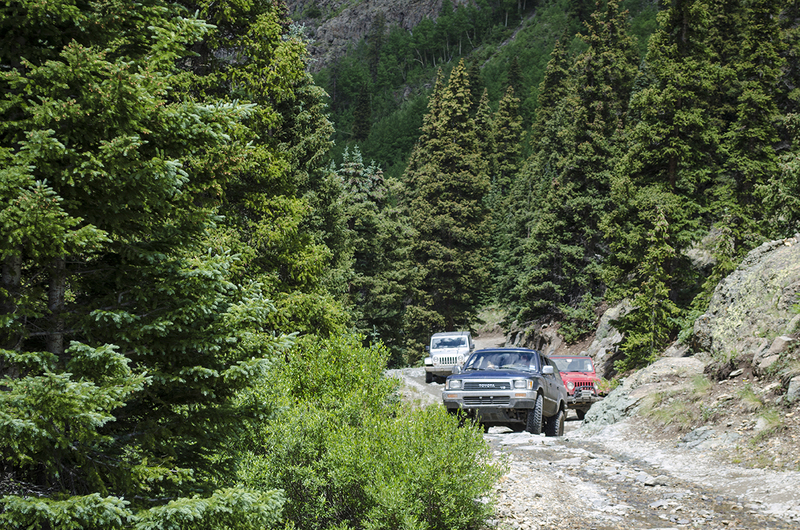 The Lariat Loop is one of the shorter byway drives, but that doesn’t mean that there aren’t a ton of things to see and do along this drive. As I prepared for this drive and conducted a little bit of Internet research to learn more, glimpses of my childhood kept coming to mind. 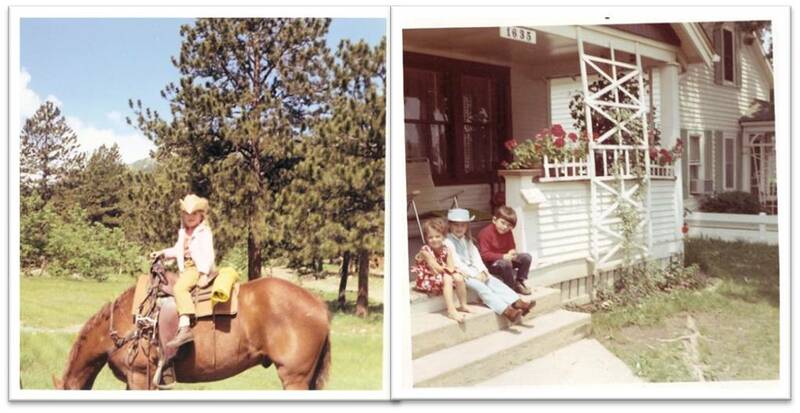 I remembered my yearning to be around horses and my brand spankin’ new sky blue cowgirl outfit my Mom had bought for my fifth birthday in 1969. It had a white button up shirt that had pearl snap buttons, a sky blue cowgirl had and red cowgirl boots. I’ve included a few photos to give the full effect and set the mood for the rest of this blog. Since this loop is so close to home, I asked my daughter to join me. Good thing I mentioned seeing Buffalo Bill’s Grave. My daughter’s heroes, as it turns out, are the Ghost Hunters crew. And considering one of their episodes took them to William Cody’s gravesite and the museum atop Lookout Mountain, she was only happy to tag along. The drive up Lookout Mountain Road to Buffalo Bill’s Grave is quite spectacular with views of Table Mountain Mesa and Denver in the background as you wind your way up the steep hillside. It’s one of the more spectacular drives on the Front Range and is frequented by cyclists, motorcyclists, runners and hikers. 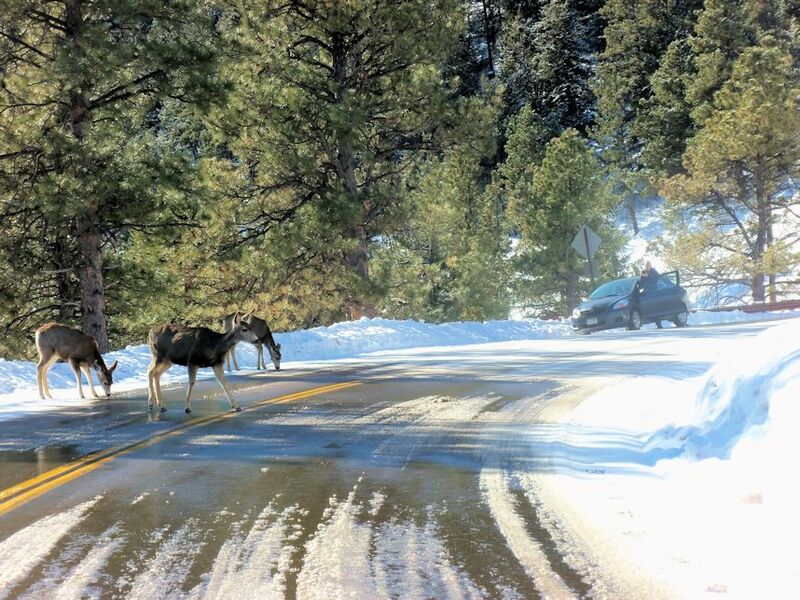 Oh, and the occasional deer. After you park in the parking lot, you can find Buffalo Bill’s grave after about a 50-foot walk up a gentle sloping hill. The grave is surrounded by Ponderosa Pine and a cast iron fence and faces southwest toward downtown Denver. Bill’s wife is also buried on this site with a smaller gravestone in front of his and on the left. Scenery: The thing about the scenery up here is that there’s quite a contrast between the ‘Old West’ feel and the high definition television towers that obstruct part of the view of Denver. 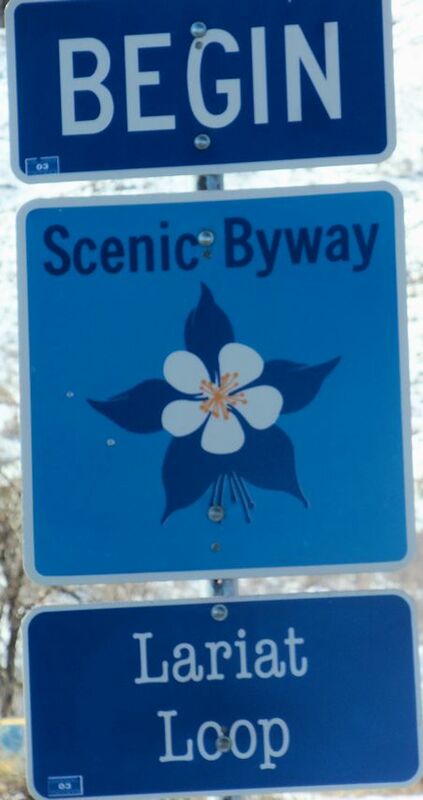 But, turn around and face West and all you see are the foothills and snowcapped Rocky Mountains for miles and miles. Museum: The museum was also a stop for the Ghost Hunters gang as it was a stop of mine and my daughter’s. When we walked inside, we were greeted by a volunteer who reminded us that there were not only stories along the museum walls that described the history of the ‘Old West’ from Bill’s perspective, but the stories continued into the men’s and women’s restrooms in each of the stalls. Yep, and we wanted to see it all. 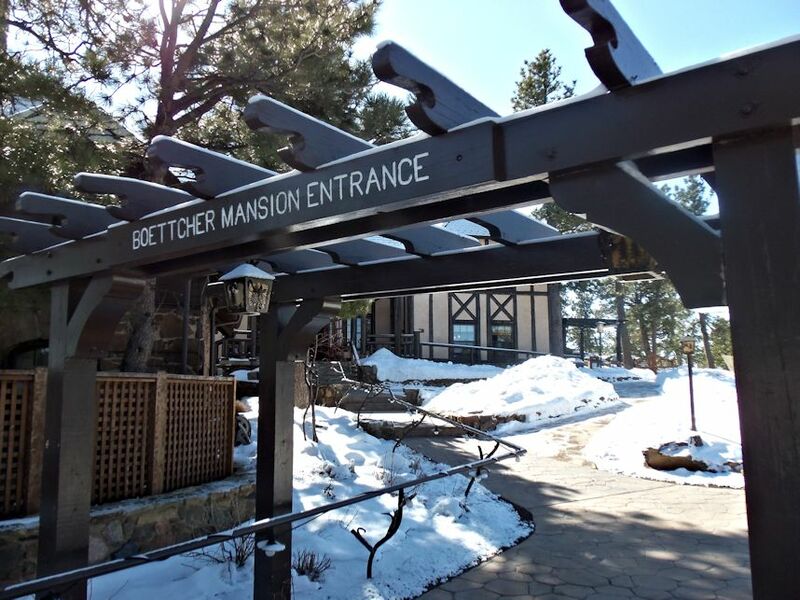 About a mile west of Buffalo Bill’s Grave, you can find yourself in a nature preserve and the Boettcher Mansion. I wasn’t aware of the history of this family, but had heard the name over the years when it came to cultural events. The Boettcher Concert Hall in Denver is home to the Denver Symphony Orchestra and is also named after this family. Today, my daughter and I would have been in for a treat, because the mansion was open and free to visitors. It turned out that there was a bridal show taking place. As we walked into the foyer, we could smell the food being prepared for tasting. We didn’t stay though, because we had many more stops to make along our journey back through history. Architecture: As we walked around the outside of this mansion before leaving, I decided to take a few photos of the home and some of its unique features. My daughter loves this style of mountain home. She kept asking if she had enough money, could she buy this place when she gets older. It made me laugh, but this home was donated to the county and is part of a nature preserve, which makes it open to the public. Personally, I can appreciate the idea that history has been preserved in this manner. The nature center – Lookout Mountain Nature Center and Preserve – that was built next to the mansion is open to the public as well and hosts many events throughout the year. This was a pretty big part of my childhood. I was baptized and raised Catholic, although never confirmed. While I am not devout, I have this keen affinity for the respect of some religious cultures. I think the last time I was at the shrine might have been 35 years ago when I was 12, so this stop was a must along the Lariat Loop. Mother Frances Xavier Cabrini: Founder of the Missionaries of the Sacred Heart, endowed with lofty gifts, struck with a stake this rock, from which flowed a fountain of water; in the Year of Our Lord 1912. I love to learn about the stories of history-makers. So, I researched Cabrini’s life and linked a website. What’s amazing to me is the work she had conducted throughout her life. As it turns out, she continued good works through her life as a teacher and missionary. The fact that she was a teacher touches me, considering I’ve spent the better part of my life in the world of education. The shrine: As the story goes, Mother Cabrini had directed nuns to move a rock and dig one summer when they commented about their thirst. She told them that they would find enough clean, fresh water to drink and wash. And the water still runs to this day, 100 years later. The grotto (part of the shrine) was first built in 1929, twelve years after Mother Cabrini’s passing. The fresh spring water flows from several spigots by the grotto. 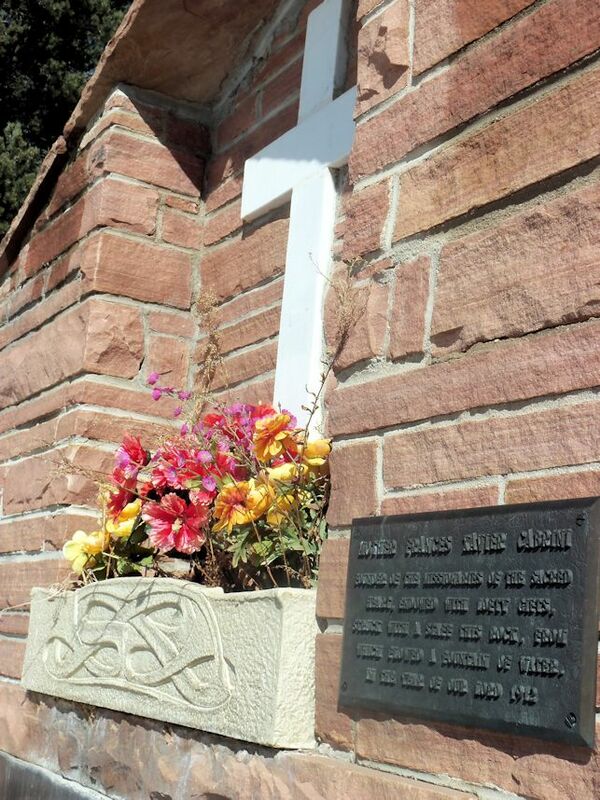 But, you can read more of the story on the Mother Cabrini Shrine website. I’ve hiked a lot and for many, many years. The longest hike I can remember as a child was when I was five-years-old. I, my brother and sister and my parents hiked the back country of the Indian Peaks Wilderness on one of our outings. The total miles were something like 17 miles round-trip…and so, it seemed fitting to make the Chief Hosa Lodge a stop along the loop. 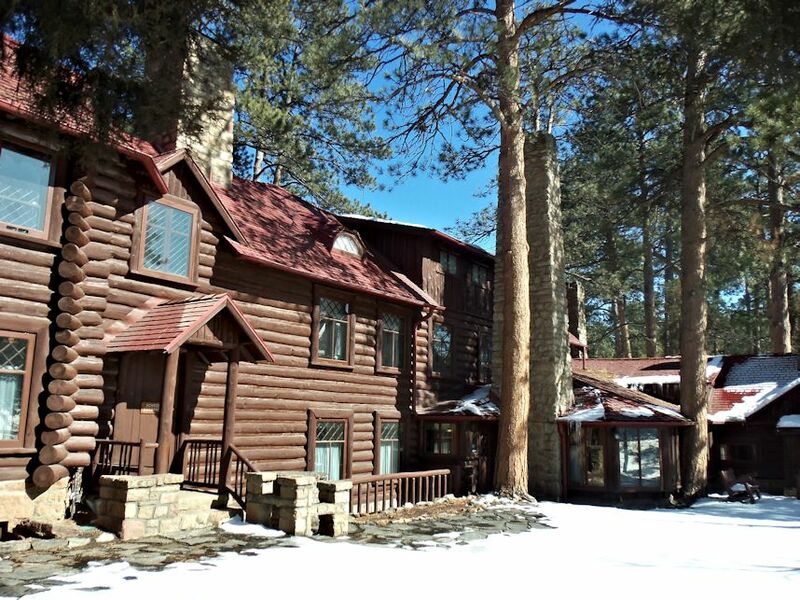 This lodge was built by a well-known architect from the early 1900s (Jacques Benedict). It served as a stop-over for hikers who hiked the back country between Genesee Park and Lookout Mountain in the early 1900s. Architecture: The west is full of its uniqueness, including the architecture that you can find in historical buildings throughout Colorado. I really like this style. The lodge itself sits atop a hill looking southwest. So the views are amazing. The uniqueness continues throughout the details of this lodge, as well. I keep finding ties to my youth. 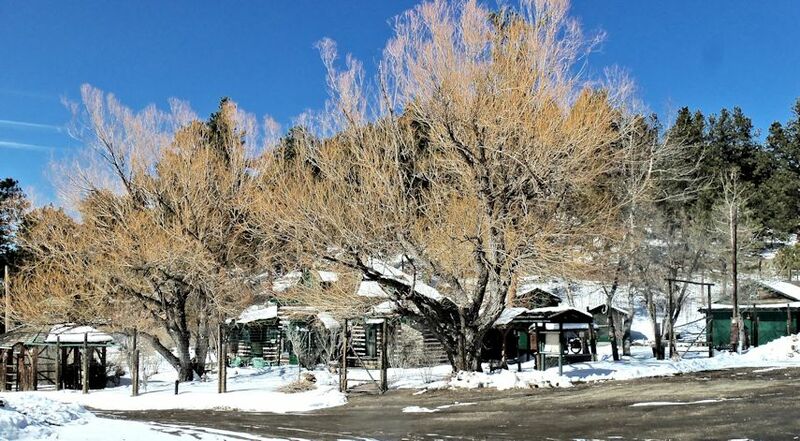 The former Hazel Humphrey was well-known as an accomplished horsewoman who also strived to save other properties in the Evergreen, Colorado area from being demolished. 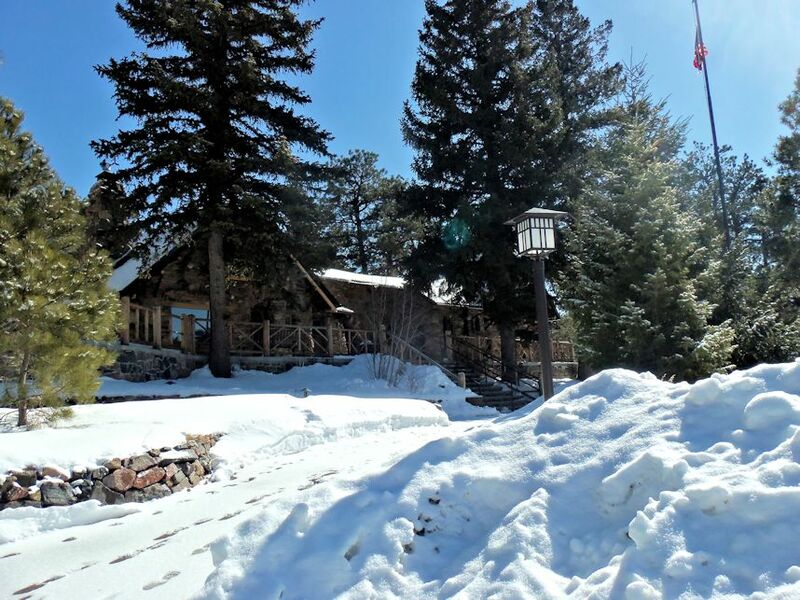 This wonderful homestead sits in an open meadow area north of Evergreen. When my daughter and I approached the gift shop which sits across the parking area from the home itself, the caretaker talked with us about all the events that take place throughout the year at the homestead. This particular homestead also grows vegetables, which visitors are allowed to harvest and take home. Because there was so much snow around the area on our visit, she decided not to charge me to walk around the home and take pictures. What piqued my interest with this place was the detail in everything. There was so much going on at every angle. I had a hard time tearing myself away. Cats: There are two cats that live on this property, which is surrounded by wire fencing and a secured gate. The caretaker asked us to be sure to fasten the gate, so that the cats would not escape. They actually live in one of the buildings on the property, as well. They were such friendly felines, too. Nestled amongst some of the tallest Ponderosa Pine I have ever seen in this state, is the last homestead on our tour: the Hiwan Homestead. Funny how the history keeps coming around for me; based on the linked research, the land that this homestead sits on was first owned by a mill and lumber operator. For me, this is significant because my ancestors, who settled in this country in 1688, were paper mill owners in the Wissahickon Valley of Pennsylvania and owners of the Monastery Stables. The land and architecture: The land around this homestead includes a park with several picnic shelters and a nature trail. There are several buildings around the main building as with the Humphrey Homestead, and these buildings include a gift shop and one for arts and crafts. The main building seems huge when up close and personal. It faces south and catches much of the sun during the day. And as with the other buildings we had walked around, this one included a few unique features. Talk about history! This park has millions of years of it all wrapped up into a tight 868 acres of colorful geologic and human enjoyment. I won’t go into any detail of the park itself, just click the link and see for yourself. Many, many musical legends have dreamed of playing at the Red Rocks Amphitheater, not to mention the trails being sought after by thousands of cyclists throughout the year. Yes, people like to ride their bicycles here, even in the winter months. The fact that this park is quite open and full of hills makes it a joy to ride around. Scenery: Back to what I came here for…the scenery. I’ve loved the geologic wonders of Colorado ever since I can remember. 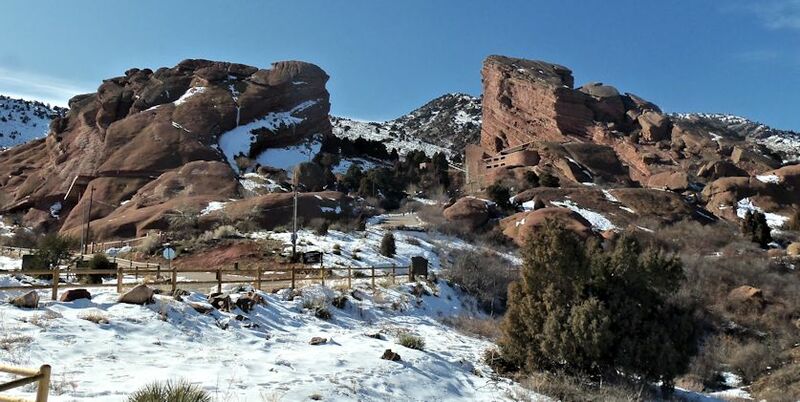 The red sandstone juts out along the Front Range foothills only in two specific areas…Red Rocks Park and the Garden of the Gods further to the south by Colorado Springs. The contrast of color is quite spectacular as well. Whether it’s a fresh blanket of snow against the red rock in the winter, or the sea of green bushes and trees against the red in the summer time, it’s a scenic photographer’s paradise. This was the final stop on our tour…and quite fitting at that, as it took us way back to the prehistoric era and the location of the edge of the shallow sea that once covered northern Colorado and the states to the north. This ridge once was a roadway that connected Red Rocks Park to the western suburbs of Denver. 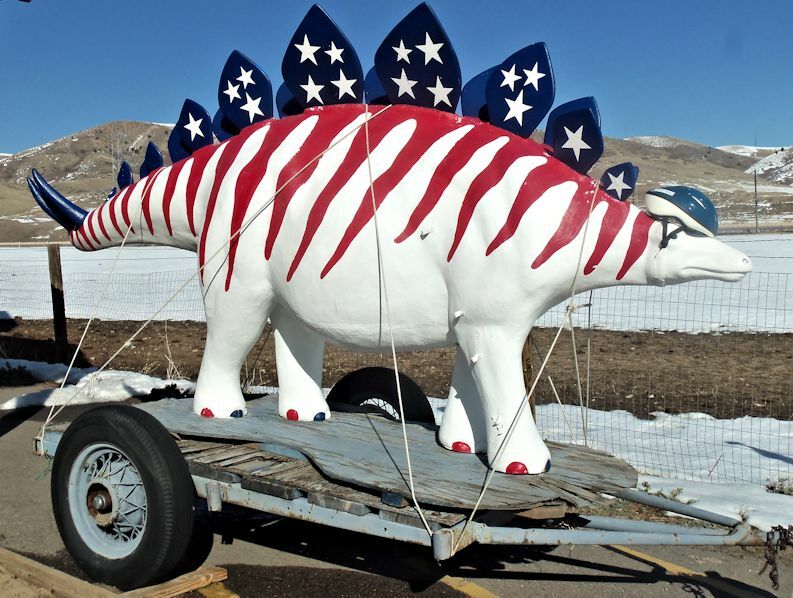 But, based on a recommendation from an Environmental Assessment conducted in the late 1990s of the area, the road was closed to preserve the paleontological elements of the area. Now, a tour bus carries the curious to stations along the roadway where fossils, footprints and bones are visible. Some memories are better left forgotten…so some may say. For me, all memories, good and bad are intact and there to remind me of a life full of adventure, love and pain. Is it luck, or is it my mind’s way of reminding me of my humanity? The same humanity I share with those who came before me, those here with me now and those to come. My hope is that my children will choose to enjoy some of the same things I have enjoyed when I leave this world. Previous Previous post: Is there something dead over there?